This was the first meeting of the year with our international nonprofit. We had members from Monterrey, Saltillo, Matamoros, Nuevo Laredo, and Laredo at our Campus. President of Mpowerment Works, a consulting firm designed to impact global change by empowering people and focusing on empowering the majority: "Women", Marisa Rivera came to our campus to talk to students and faculty on the importance of women being empowered to create change. This was the first meeting and discussion between TAMIU and ANUIES from Mexico. Universities from all over Mexico came to our campus for a conference and panel presentation on what TAMIU has to offer. During this event, there was an MOU signing with Instituto Tecnologico de Nuevo Laredo. One of our International Executive Seminar series, where we had presentations by the Rio Grande International Study Center (RGISC), Comision Internacional de Limites y Aguas (CILA) de Nuevo Laredo, and the International Boundary and Water Commission. This was our yearly event with Instituto Tecnologico de Nuevo Laredo, where we hosted about 100 of their Engineering students on topics of interest in their field of study and opportunities available to them as upcoming graduates. Some of the topics covered were "Engineering and Water Management/Northern Region" by Comision de Limites y Aguas (CILA) de Nuevo Laredo, "Engineering & Development of Shale Exploration/Northern Region" by Chesapeake Energy, a presentation on working Visas for professionals by the U.S. Consulate, and "Vision for the Northern Region" by WTD GeoScience Services. This is an annual event where the local U.S. and Mexican consuls get together to discuss cross-border issues. On this occasion some of the topics addressed were trade, security, commerce, and international infrastructure. Guest speakers included U.S. Congressman Henry Cuellar and Mexican Federal Deputy Glafiro Salinas Mendiola, as well as scholars from the Mexico Institute at the Woodrow Wilson Center, Christopher Wilson and Steve Dudley who presented their most recent work titled "Working Together: Economic Ties between Mexico and the United States". May 6, 2013 - "Bag It: Is your Life Too Plastic?" The Binational Center along with the Rio Grande International Study Center hosted a special screening of the Award-winning documentary "Bag It: Is your Life Too Plastic?" at the TAMIU Student Center Theater. We had many students at both screenings to learn about the terrible effects of plastic bags and other consumer merchandise on land ecosystems, the marine environment, and even the human body. This was the second meeting of the year with our international nonprofit. We had members from Monterrey, Saltillo, and Nuevo Laredo at our Campus. This was the third meeting of the year with our international nonprofit. We had members from Monterrey, Saltillo, and Nuevo Laredo at our Campus, who stayed for our Summer Institute taking place the following day. Administrators from Universidad Panamericana came to our Campus to meet and discuss possible collaborations and an Memorandom of Agreement was signed for this to be possible. This was a presentation given by Binational Center Director, Maria Eugenia Calderón-Porter in Mexico City to an audience of over 400 attendees at an event sponsored/organized by AMESPAC, COPARMEX, and Club de Industriales. Dr. Marlon Brevé, academic Vice President of UNITEC came to TAMIU to meet with several of our Administrators and Colleges to form possible collaborations and programs. 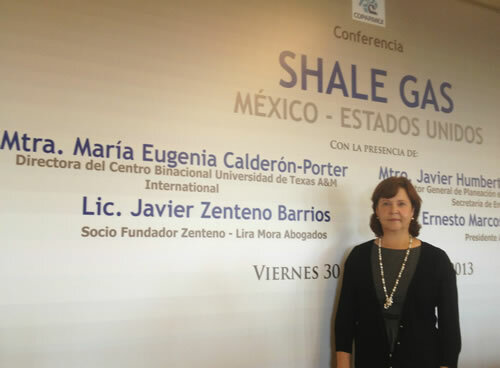 Several organizations from Nuevo Laredo were at our University for a meeting and presentation on "Shale Gas: Experiences and Opportunities" by the Binational Center Director, Maria Eugenia Calderon-Porter. The Binational Center and the College of Business Administration hosted the UAT on the last day of their Conference titled "1er Congreso Internacional en Competitividad, Negocios, Logistica, Tecnologias, Desarrollo Economico y Sustentabilidad". Mexico’s government will announce the extent of its Energy Reforms by November 15th. We invite you to attend a presentation of opportunities available to the USA Industry and an explanation of what the new laws mean to the international petroleum/gas economy. Please join us at this very important event. Click here to see the agenda for the day. Representatives from UAC, Dr. Luis Fernando Camacho, Ing. Eduardo Garza, and Lic. Melissa Rodriguez were at our campus to meet with our Administrators and representatives from our Colleges to form possible collaborations and develop programs for an MOA.